We experiment constantly to uncover the most effective and efficient ways to create nutrient-rich compost for field production. At our compost yard, long windrows are built from a combination of on-farm wastes—like animal manure and crop residues—and outside materials, like leaves and grass, from local municipalities. We generate five to 10 thousand pounds per year of finished compost. 90% of that gets used on our farm, and 10% is sold to the public. Looking for premium compost to use at home? Stop by the Garden Store today. 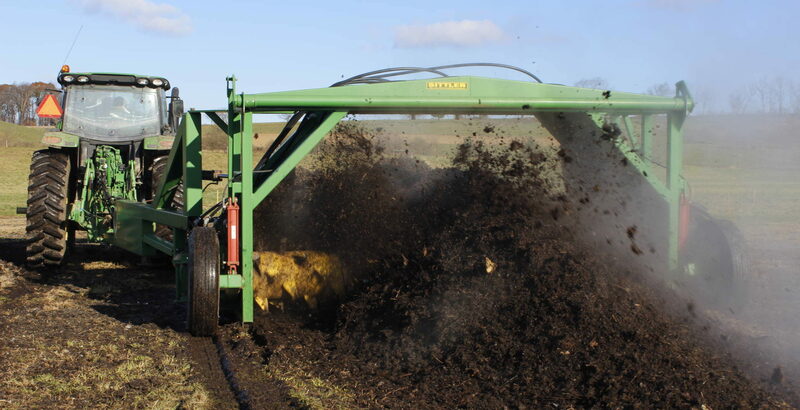 Current focuses of research include analyzing the presence of heavy metals in compost, nutrient variability in windrow composting, and management strategies for swine manure to control parasites.